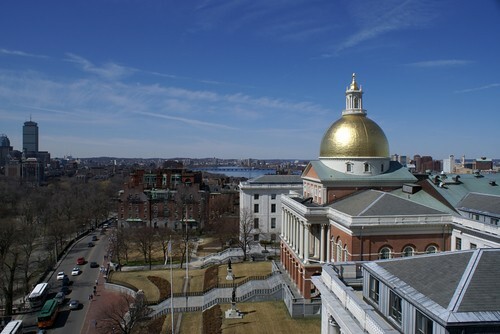 More than 70 NAGE officers, members and staff joined hundreds of brothers and sisters in organized labor at the Massachusetts State House on April 2 to ask legislators to stop proposed health care cost increases on public workers. What the Group Insurance Commission has done is shifted the cost of $160 million…over to the rate payers….Not one dollar of that $160 million is a cost savings. It’s a cost shifting. …. [Over the years] billions and billions and billions of dollars have been shifted over onto public employees. It’s disgraceful. NAGE plans to file an amendment to the soon-to-be-released House budget. The amendment will call on the House to roll back the current 25% premium share for state workers hired from 2003 onward so that they will pay the same 20% premium share as workers hired before 2003. The move would soften the impact of the increases in copays and deductibles, as well as the premium increases of up to 9% approved by the GIC this year for its members’ insurance plans. Neither branch has finished work on its budget proposal yet. Many lobbying teams covered the Senate side of the building, hoping to convince legislators to leave any cost-shifting proposals out of their budget plans. The lobby day was only the first in what will likely be a 90-day push to ensure fairness for public employees in the FY2016 state budget. We’ll update you here on NAGE.org with any developments and ways you can help. We are asking all of our members to send their representatives and senators our advocacy letter asking them to protect state workers’ rights. Please use the “Find your State Rep.” and “Find your State Senator” links to get your legislator’ email links. Then download the letters, add your name at the bottom of the letter, attach the document to your email and click send. We urge all of our members to participate. If you need any assistance, please contact Adair Gregory, agregory@nage.org. We’ll update you here on NAGE.org with any developments and ways you can help. Find your State Rep. Letter to your State Rep.